Ciao a tutti…!! Come state? Today we want to give you a simple recipe but the taste is very nice and have lot of benefits for your body. This recipe is about fish. Do you know that fish is a super food? It’s packed with vitamins and minerals, and a major source of omega-3 fatty acids, fish can help to protect against a range of diseases, from cancer to heart disease, asthma, depression to arthritis. Using food processor (pestle & mortar), combine all the ingredients and grind to a smooth paste. Use the paste to marinate the fish and let it rest in the fridge for about 20 minutes. While waiting…make the sauce. Start with cut the tomato into dice, and chili into 1/2 cm. Put everything in a bowl and add sweet soy sauce, salt, and fried onion, mix well. Now you can start to heat the oil in a frying pan. When it’s hot, place the fish slowly into the pan, and deep fry the fish in medium heat for more or less 15 minutes. When it’s cook, take out the fish and put on the paper towel to absorb the excess oil. 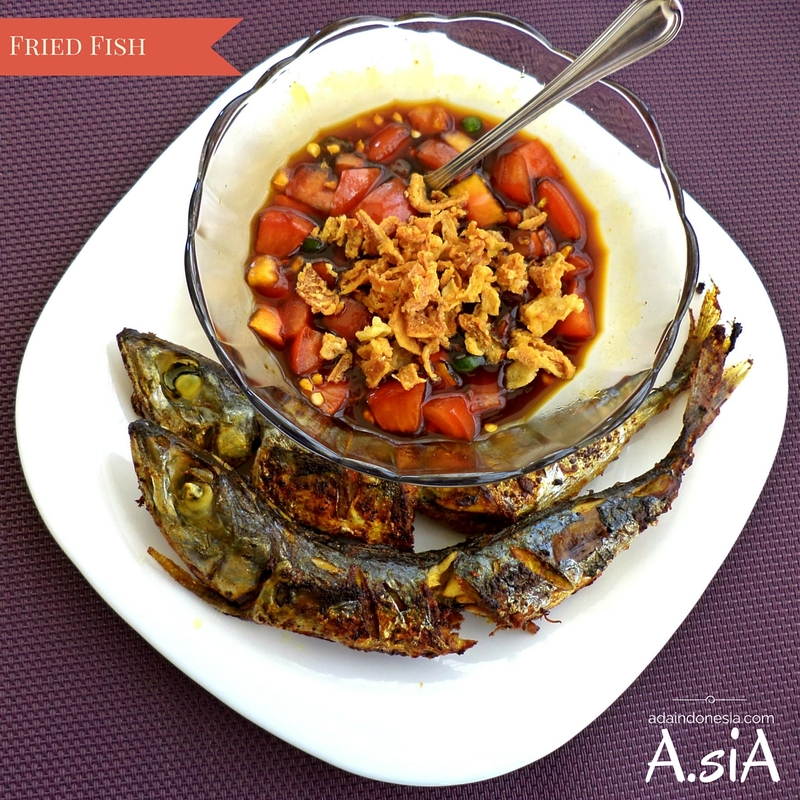 Serve the fish on a plate with sambal kecap and hot steam rice. It’s also nice to fry the fish a little bit longer, so the fish will be crispy.Thank you for visiting our website. We love to hear from you, so please leave your comment down bellow. Enjoy this recipe, and take care! We’ll see you again in our next post. Tetap di Ada Indonesia…see you soon!